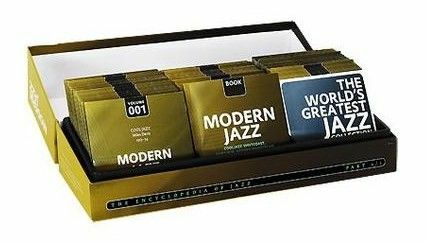 Amazing 100 CD Set of containing a plethora of Classic Jazz tunes. New Orleans was the starting point of the collective improvisation. The Jazz for which the city on the Mississippi Delta was to become so famous for developed at the beginning of the 20th century. From New Orleans to Harlem. The most important recordings of the golden age. Mit King Oliver, Jelly Roll Morton, Louis Armstrong, Johnny Dodds, Jimmie Noone, Sidney Bechet, Bix Beiderbecke, Duke Ellington, Fletcher Henderson, Earl Hines, Jack Teagarden, Red Nichols, Clarence Williams, Muggsy Spanier, Frank Teschemacher, Adrian Rollini u.a. 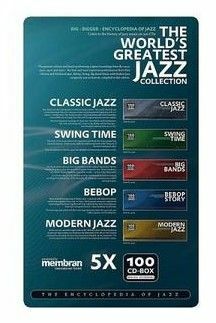 100-CD-Box with original recordings. 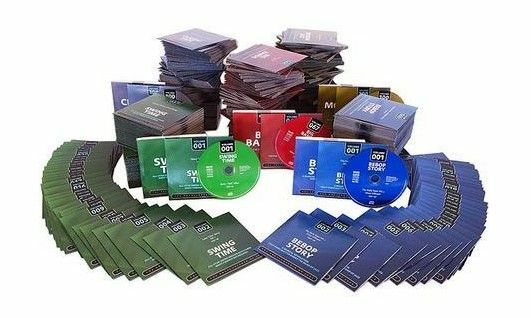 From the early days to the late 1950s, the highlights of Swing are presented on these 100 CDs. The music of the decade between the Depression and World War II gave people hope – and entertainment. Swing records, ballrooms and touring bands made Swing one of the most rousing Jazz styles. One of the reasons is evidently that the music was made for dancing and people were tempted to dance. But the big bands alone were not the cause of the jazz craze but also the abundance of small groups presenting the best soloists at the time. The swing era celebrated them: soloists such as Lester Young whose later work is covered to a great extent in the encyclopedia, or Coleman Hawkins, Ben Webster, Jack Teagarden, Oscar Peterson, Teddy Wilson, Roy Eldridge. A number of the great swing musicians met in Lionel Hampton’s small groups. In 1937 the vibraphonist began recording under his own name and the conditions were extremely favorable. He had signed a contract with the Victor label which enabled him to get any musician he liked into the recording studio. Consequently he recorded with the elite of jazz musicians, producing swinging gems. Similarly thrilling are the recordings of jam sessions and all-star groups; the set-up often looks like a who-is-who of the greatest jazz musicians. Jazz musicians always loved jam sessions but in the past they could not be recorded because the sessions were too long for the old shellac records. Only when the long-playing record had started its triumphant advance in 1953, it was possible to record long sessions. 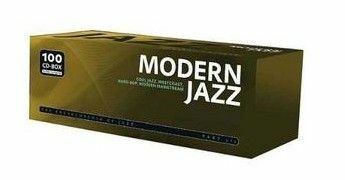 Technical progress introduced a new quality into recorded jazz.